Nesbitt's Drinks - Bottle Hanger - C. 1970's. (1655) Nesbitt's Drinks - Bottle Hanger - C. 1960's to 1970's. - Condition: Very Good Cute Nesbitt Monster that was used in the advertising promotion for Nesbitt's Drinks. 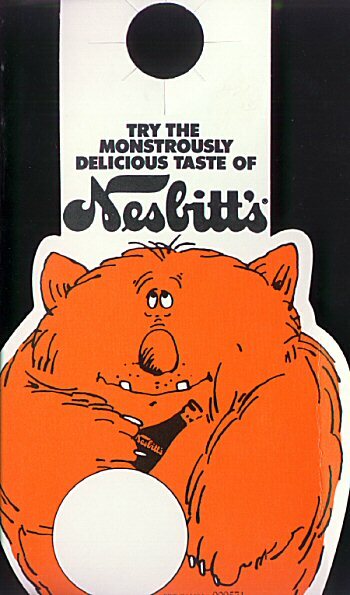 Says "Try the monstrously delicious taste of Nesbitt's". This was meant to hang off of a bottle in a six pack of drinks. Nesbitt's was founded in 1924, and produced syrups to be added to soda drinks. Nesbitt's Orange Drink had 10% California Juice. Nesbitt Fruit Products was sold to Clorox in 1972. Has one crease on right side. Measures 5 1/2" by 9". Price: $6.00 + shipping.